Pressure washing with bleach is a very effective way to remove mold and mildew from a surface. 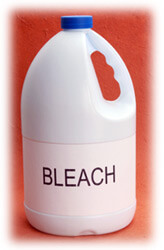 Bleach can also remove color from clothing, kill vegetation and corrode metal, so it is not an all-purpose cleaner. As with most chemicals, though, when used properly, bleach can simplify your pressure washing jobs and please your customers. As mentioned above, pressure washing with bleach is primarily for cleaning mold and mildew from surfaces. Simply mixing bleach with water is not very effective, however, because the water will bead on the surface, causing spotty application and uneven results. If you mix a bleach compatible detergent in with the bleach solution, you will get uniform coverage and even results. Bleach is not one compound, but a class of chemical compounds called oxidizers. An oxidizer breaks down cell membranes and damages cell proteins. When bleach is used on organic pigments and dyes such as food stains, it breaks down those pigments at the cellular level, causing them to dissolve. By obliterating the pigments, bleach whitens any material it comes in contact with. When used on mold or mildew, which are basically small plants, bleach kills the plant off by the same kind of biological warfare it inflicts on ketchup stains. While this nasty habit of killing cells makes bleach a great cleaner and disinfectant, that capacity also makes it very bad for nasturtiums or skin.